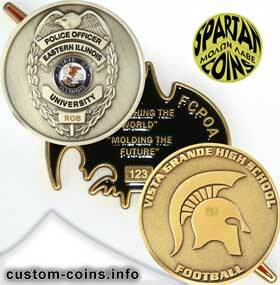 When you think about custom silver coins you’re probably thinking of .999 fine silver coins. Why wouldn’t you? .999 fine silver coins represent a sound investment opportunity because they are real silver, 99.9 percent pure silver to be exact. Silver has intrinsic value which means the coins you create will at least have a value equal to the market value of the silver content of your coin. A one troy ounce three nine fine coin will have a full market value price. The benefit of creating your own custom .999 fine silver coins are easy to see. First you get to use your coins as a creative outlet, a good investment opportunity and an educated hedge against inflation, or God forbid as something to barter with should the economy completely collapse. When you decide to create custom fine silver coins you will need to decide what strike you want, who will mint your custom coins, will they accept your silver or will you have to buy theirs and your shipping insurance options. Silver content is a contributing factor to what drives numismatists to collect old United States currency coins that are either solid or have a high concentration of silver. These coins have value far beyond their face value of 25 cents or 10 cents. A cost effective alternative to creating fine silver coins is to create custom brass coins, more commonly known as challenge coins or military coins. Your custom brass coins can be plated with .999 fine silver or 24 karat gold which allows you the middle ground to experience the best of both worlds. Value for your money and value to your end consumer or collector. When it comes to creating custom challenge coins there are many silver colored plating options such as chromium, nickel and rhodium. A word to the wise about selecting silver as your coin plating choice. Due to the presence of actual .999 fine silver in the plating bathes your coin may end up tarnishing in the future if it not properly cared for. Selecting nickel as your plating choice may be your best option. As always, be good to yourselves and each other. God bless!